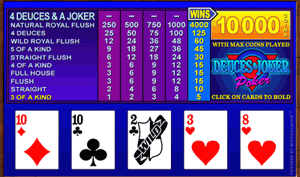 Deuces and Joker Power Poker is different from a standard video poker as you play four hands of cards at the same time. A complete deck of 53 cards is used for each hand, instead of the normal 52 cards. The extra card is a Joker and is a wild card. The Joker stands in for cards of any denomination and suit to complete a winning hand. The Deuces in the deck are wild. The Deuces are cards with a face value of two. Whenever you are dealt a Deuce, it is automatically assigned a denomination and suit. The Joker and Deuces substitute for cards of any denomination and suit to complete a winning hand. This gives you the highest possible payout for the cards you are holding. The maximum payout in Deuces and Joker Power Poker is 10,000 coins.